Fans of The Jetsons or Blade Runner may ask, “Where are my flying taxis?” but their wait may soon be over. 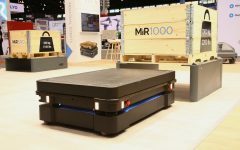 Meanwhile, the geopolitical rivalry between the U.S. and China is affecting trade and the automation industry, and Toyota is taking the next step toward humanoid robots in the home. Robotics Business Review has partnered with the Center for Innovating the Future to provide its members with cutting-edge insights into recent developments in international robotics, artificial intelligence, and unmanned systems. Are you ready to be updated? Over the coming years, several German businesses and institutions, including Bosch and Fraunhofer-Gesellschaft, plan to invest more than $5 billion into Dresden to set up the city as a hub for the Internet of Things (IoT). The initiative has several objectives, such as developing new processors and sensors, as well as creating new infrastructure for 5G connectivity. This is part of a broader strategy by the German government called the “national digital hub concept.” Dresden was one of two cities selected for this concept, along with Leipzig. Like robotics, IoT may have been eclipsed lately as a buzzword by AI, but 70% of Fortune 100 companies are innovating with the technology, according to inField Clipboard. Germany’s digital hubs may not be part of a global resurgence of interest in IoT, but governments are becoming more knowledgeable about where to invest. The push toward smart cities and cars is also helping. During President Donald Trump’s recent visit to Asia, the challenges of addressing intellectual property theft and unfair trade practices were front and center. While Trump toured Beijing, legislators in Washington approved increasing the size and jurisdiction of the Committee on Foreign Investment in the U.S., largely to clamp down on Chinese investments. Congress said that such action would protect American jobs, but restrictions could also harm Silicon Valley. This convergence and conflict of Chinese and U.S. interests, mixed with significant risks, creates an uncertain future for global technology. If more limits on Chinese investment such as those being considered in the U.S. or Germany emerge, Beijing could respond in kind. Robotics and AI suppliers and end users would lose out. Ehang Inc. plans in 2018 to unveil flying taxis in Dubai. The autonomous vehicle would carry two people and is based on the company’s single-passenger E-184. Currently, the drone is being tested in Guangzhou, a city that is central to China’s strategy for transitioning its economy away from low-end manufacturing. Ehang’s flying taxis are just one example of this rapidly developing application. Caltech’s Center for Autonomous Systems and Technologies is working on a flying ambulance, and Airbus is working on its own flying taxis for next year. Within a few short years, aerial drones have gone from being a military tool to a gadget for hobbyists and professionals, and soon a passenger transport. Several roadblocks remain, such as convincing the public of safety and creating business-friendly government policies. However, the speed at which unmanned and autonomous vehicles have advanced shows how other areas of robotics could take off. T-HR3 is the name of a new humanoid robot from Toyota, which mimics the behavior of the user through a wearable interface. The applications of the T-HR3 are broad, such as helping in elder care, for disaster relief, or even in space. However, Toyota has not unveiled pricing details yet. Toyota’s latest robot is noteworthy because it combines virtual reality remote control or teaching, a humanoid design, and the goal of household use. Most robots today are narrow in purpose and are not humanoid, but consumers expect to interact with such androids soon. Does China threaten balance of power with AI? An American think tank has published a report that warns, among other things, that China could expand its economic and military power through AI. The Center for a New American Security states that China has become an AI “peer” to the U.S. and that senior officials in the People’s Liberation Army are envisioning a “singularity” on the battlefield, when AI and machines can outperform humans. Many experts have expressed surprise in reaction to China’s push to develop its geopolitical power through AI. Celebrity investor Mark Cuban recently joined the chorus warning about the AI race, even as others herald the push toward smarter robots. As a geopolitical futurist, I have been discussing such threats for several years. For instance, Chinese officials recently met with a leader of the Campaign to Stop Killer Robots. The officials rejected any suggestion that China slow its pursuit of military automation — mainly because they were watching the West. I have noted that such incidents demonstrate not only a divide in how nations are approaching AI, but also that countries will try to control AI in other countries.